Online Registration | Registration is free! The Asia OA Meeting provides an opportunity to learn about global trends, share information across Asian countries, and help with local strategies for increasing the adoption of open access & open science in participating countries as well in Bangladesh. 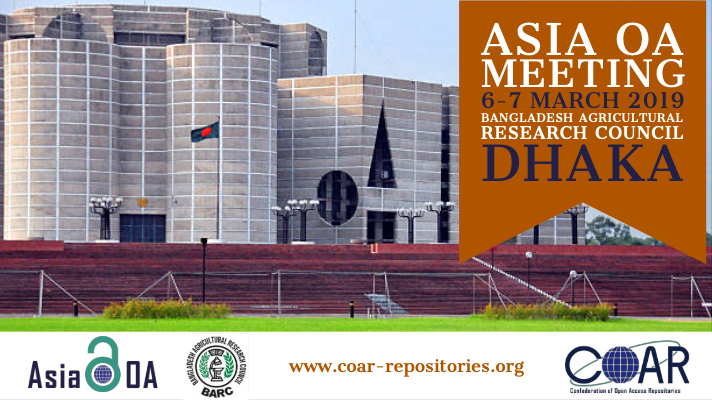 Participants can learn about the latest development related to the Confederation of Open Access Repositories (COAR) next generation repositories initiative and hear about the work being done in other countries in Asia and beyond. EU Datathon 2019 - Launch (on 28 January 2019) of the Open Data competition! 2 March 2019 - international Open Data Day 2019! By making Your Voice heard, You will bring even more life to the upcoming exciting ODD events! AIMS.FAO.ORG is looking forward towards creating awareness of the work done in Open Access, Open Data, Open Science through dialogue, capacity development, collaboration and diversity, - in this way science can be advanced much faster, addressing the SDGs (Sustainable Development Goals).